Student evaluation of effective teaching practices in General Chemistry: What makes effective instruction effective? This project proposes a study of effective teaching practices that uses a naturalistic approach and encompasses all three components of the learning environment (i.e., the instructor, the students, and the classroom). 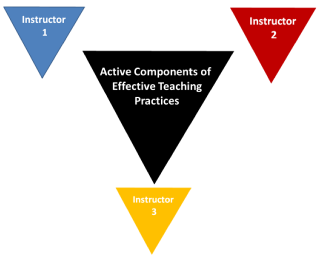 This approach intends to distill the instructional strategies (active components) that characterize effective teaching practices that better promote learning in general chemistry courses. For this purpose, this project studies the learning environment of instructors who are effective based on students’ perception. 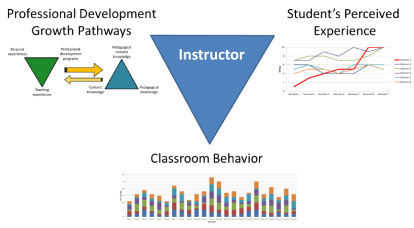 The factors that influence student success in their learning experience relate to the instructors’ behaviors, the instructional strategies, the learning settings, and the learning processes. These factors influence and affect the students within the context of the learning environment. Therefore, making the quality of teaching and students’ experiences in general chemistry courses a top priority will contribute to attracting and retaining students in chemistry and chemistry-related fields. The purpose of this project is to investigate the development of self-explaining as a skill using a multiple-activity design. Findings from the project will shed light into the applicability of self-explaining as an active component of chemistry learning. Research on the self-explaining effect has shown that careful design of activities can lead to authentic learning in the sciences. However, little direct evidence exists that self-explaining (as a learning strategy) provides a useful function in the way(s) students learn chemistry at college level. In a recent review of literature on research on self-explaining at college level only two papers (out of 57 papers) investigated chemistry content knowledge, and in the last year only two papers (out of 20 papers) did. This indicates that the study of the self-explaining effect on chemistry education at college level is an under-researched field. Also, more than 70% of the published papers were done in laboratory settings, that is, non-naturalistic learning environments. This study comes to fill that void in knowledge by investigating the self-explaining effect in the natural environment of introductory chemistry courses. For this purpose, I will study the effect of self-explaining on students’ conceptual understanding and skill development, via multiple in-class activities along the duration of the chemistry course. The in-class activities consist of chemistry problems that present students with experimental data for them to develop their self-explaining skill. This approach will maintain the outcomes of the project truthful to the undergraduates’ experience in introductory chemistry courses. The outcomes of this project will provide a deeper understanding of effectiveness of self-explaining in introductory chemistry thus contributing to the improvement of undergraduate chemistry education.